The most critical challenge to mezzotint came from yet another technical area that was developing by leaps and bounds, the photographic processes. Englishman Fox Talbot was granted a patent for photogravure in 1858. This definitely was the most serious threat to mezzotint. It could reproduce exact images of paintings or portraits very quickly. Sizes could be adapted to any proportional format. In only twenty years, by 1879 photogravure was the most popular reproductive method. Not only was it efficient but it freed the publishers from having to pay the high engravers fees, and many plates could be made from one negative so editions became virtually unlimited. Artists and publishers were also freed from having to deal with engravers interpretations of subjects and their sometimes surly attitudes. Photography and thus photogravure eliminated the need for portrait painters and could be used much more easily for family portraits. With burning and dodging techniques negatives could be doctored leaving out unsightly details and imperfections so the family portrait was always perfect. Another development that was critical to mezzotint was the Industrial Revolution which changed the apprenticeship system. Many mezzotint engravers had to start rocking their own plates taking time from the actual creative work and making production more difficult and time consuming. So, through disuse many of the techniques for working on copper plates were slowly being lost. 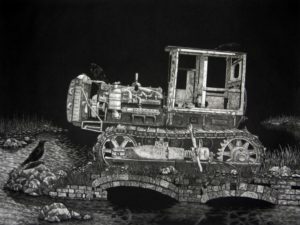 At first the Industrial Revolution contributed to the growth of the mezzotint industry but in the end it accelerated the demise of this once popular technique. The Industrial Revolution’s focus on economic efficiency and production pushed the beautiful but difficult and time consuming mezzotint aside. By the late 1800’s very few people other than artists had a need for mezzotint. There was an abundance of printmaking techniques at the end of the nineteenth century and inevitably artists developed favorites. Some liked the controlled expressiveness of the engraved line; others preferred the freedom of drawing on a stone or the precision of the etched line. James McNeil Whistler and Sir Francis Haden were experimenting with dry-point and etching. The impressionists also were drawn to printmaking. The absence of trained teachers and craftsmen led artists to teach themselves technique and method in their constant search for individual style and creativeness. Mezzotint was seldom used during the second half of the 19th century. Not many people knew how to make mezzotints and there was a danger of the technique being lost. Due to a few key people the method of mezzotint began a slow and arduous revival. First among them should be mentioned Sir Frank Short, born in England in 1857. After being fascinated with mezzotints at the National Gallery of Art he decided to begin making mezzotints. He was a prolific artist. Sir Frank Short eventually completed J.M.W. Turner’s plan to issue a series of one hundred landscapes in mezzotint. He also produced forty five prints based on the images of Constable, Turner and Peter de Wint. Sir Frank Short’s mezzotint work is commendable to say the least but his technical and informational dissemination are also important in the revival of mezzotint. He personally rediscovered many of the old methods and found ways to deal with newer technology such as the hammered metal plates that were being produced which tended to be softer that the older variety. Another important person in the revival of mezzotint was Arlent Edwards who was born in Somerset, England in 1862. Arlent Edwards learned mezzotint from a few of the late nineteenth century reproductive engravers. His subject matter was neoclassic in style and while his prints do not have great public appeal now they were very much appreciated during his lifetime. In 1890 Arlent moved to the United States where he continued producing mezzotints and mastering his revived method of printing multiple colors from one plate. He printed all his own work and destroyed the plates after a set number of impressions. During the careers of Sir Frank Short and Arlent Edwards mezzotint was in a state of hibernation kept alive only through the efforts of these men and a few others. Very few artists knew how to make mezzotints at this time. The first half of the twentieth century saw a growing interest in printmaking and some people were becoming aware of the beautiful old mezzotints and began to seek information on this obscure technique. A small number of artists including M.C. Escher and Joseph Pennel at first and later Mario Avati and Yozo Hamaguchi began to breathe new life into this almost forgotten technique and it wasn’t until about 1960 that its popularity began to rise. During the 1960’s and 1970’s few artists were working in mezzotint but it was still seen, although infrequently. Public infatuation with modern science at the time was not conducive to a slow time consuming technique. Life was supposed to be faster and easier. The development of computers was to help solve all of life’s daily problems and give people more time to relax and enjoy. And many artists saw the home computer as a threat to their old technique’s unique mode of expression. But in retrospect the computer has helped awaken a renewed interest in older techniques of printmaking by giving people more time to explore and look for the unusual. While many artists are turning to the computer as a new mode of expression many of these same people are learning to appreciate a creative method that is entirely done by hand and takes enough time and effort that the creator begins to feel that he is really expressing part of himself in his work. With computer generated imagery there is always a program between the artist and the final product. Photoshop, CorelDraw, there are many imaging programs available. In a way they limit the artist, they only allow the artist certain options, certain choices of how to make a line or how to arrange a composition. Granted these choices are vast one still must work within the limitations of the programs. Computer artists would argue that the pencil is a limitation also. But it is a physical limitation that doesn’t limit the imagination. An artist does not look to a pencil to see what options he has to make lines or create compositions or graduate tones. The artist is free to choose how to do all these things. There is no list of options to choose from and the artist must think creatively and find his own identity and the solutions to the challenges that his work creates. Mezzotint is not without limitations. First of all one has to rock a plate. Many find this limitation unsurpassable and these people choose not to make mezzotints. But there are many people worldwide who have made mezzotints. Any serious student of printmaking has tried mezzotint. 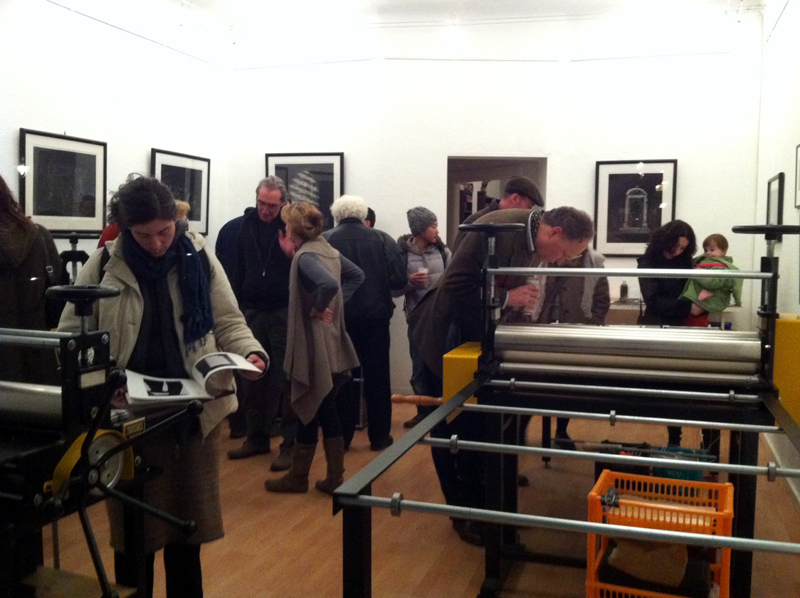 The number of artists who work only in mezzotint is very small but seems to be growing. From the early 1970’s the number of mezzotint artists has grown from a handful to a considerable number when one thinks of the late 1800’s when almost no one was making mezzotints. Another interesting aspect of mezzotint is that the tools have not undergone drastic changes. Today’s mezzotint rocker is basically the same as the ones developed and used by Prince Rupert and Wallerant Vaillant in the late 1600’s. Metallurgy has changed and the quality of the rockers made today is better because of this. Scrapers and burnishers have also improved because of modern steel making methods but the design of these tools has stayed the same. Many artists make their own tools. They use steel blanks and form and sharpen them to the shapes that they find most comfortable. Artists today also adapt other materials to mezzotint. Different grades of steel wool can be used to modify plate texture and even give slight plate tone. Carborundum papers can be used to lighten areas or smooth out delicate plate tones. Sharpening stones formed into specific shapes can be used on grounded plates to create a chalk like effect. Only the imagination limits the ways a mezzotint ground can be modified. The mezzotints produced today have a wider range of subject matter and creative intent than mezzotints of 150 years ago. It is safe to say that mezzotint has made a successful comeback to popularity. From its beginning in 1642 mezzotint has been a unique method of creating a printable image. 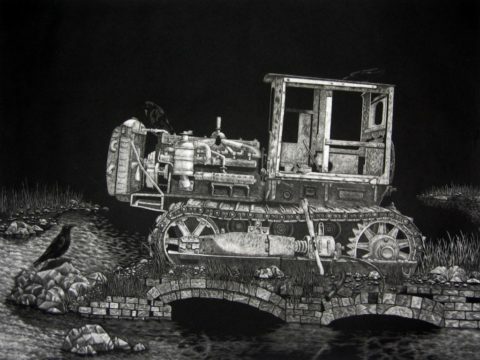 The history of mezzotint is also very interesting with its close connection to business, politics, publishing and the Industrial Revolution. Its rise and fall in popularity do not reflect the public interest in prints and printmaking but do reflect artistic interest in mezzotint as an art form and not only a reproductive method. Mezzotint still enjoys respect as a difficult technique and also as a method that allows the artist to show his creative skills to the utmost degree. Mezzotint has come full circle, from its discovery in 1642, to ultimate popularity, to almost complete disuse and then to rediscovery in the late 1800’s. Mezzotint seems to have survived its most serious challenge to date, the advent of the computer. It is still a time consuming, difficult technique. But it still can be beautiful and is still unique.